The Car Seat Key Do you struggle unbuckling that red button on your child’s car seat? Well we have the solution. The Car Seat Key is an amazing tool you can use in your day to day life. It allows you to press in that dreaded red car seat button with ease and release your child from their car seat without suffering from aching hands or broken nails. Simply slide it over the buckle and with slight pressure VOILA its opened! We have tested our product on every car seat on the market and it has worked with ease! 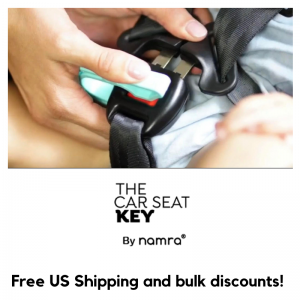 Free US Shipping and Bulk Discounts – Save with The Car Seat Key. Buy (2) Save $4.00 Buy (3) Save $9.00 Buy (4) Save $14.00 Buy (5) Save $19.00 Discount is automatically applied at checkout! P.S. We'd love to see your smiling face... go get a gravatar!